Hey, I will be your captain. Hi there, I am Evgheni – your captain. I am Moldavian-Italian living in Malta. I am 32 years old and I have been sailing for last 3 years. I always had a passion for the sea, which brought me to buy a sailing yacht, and get the Skipper license to be able to do what I love as my main job. I hope you will have same passion about sailing as I do, after a day out at sea with me on our sailing boat. I will do my best so that you can enjoy your day at sea in Malta and have some nice memories to take home with you. In case you are interested, I will show you how to use the sails. Or you can just relax and I do all the rest. We can put the route of the day together in order for you to visit the nicest bays in Malta. I will guide you trough the day for you to enjoy it as much as possible, have fun and be safe. 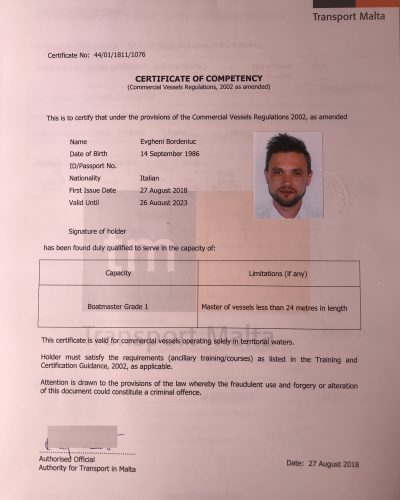 2018 – Boat Master License of Commercial Vessels less than 24 mt in length.